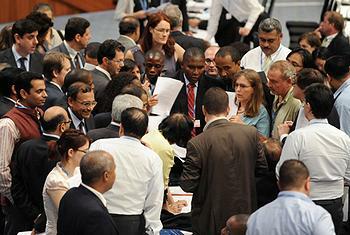 BONN, Germany, June 7, 2011 (ENS) – Delegates from 183 countries got down to business at a United Nations preparatory climate change conference in Bonn today. For the next 11 days they will work towards a draft agreement on limiting greenhouse gas emissions that can serve as the basis of negotiations at the annual UN Climate Summit set to start November 28 in Durban, South Africa. As new data showing another rise in atmospheric greenhouse gas emissions emerged, the UN’s top climate change official called on governments to make progress in the fight against global warming, building on the commitments they made last year at Cancun, Mexico. 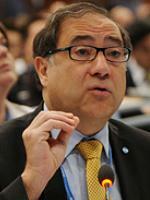 “Governments lit a beacon in Cancun towards a low-emission world which is resilient to climate change. They committed themselves to a maximum global average temperature rise of two degrees Celsius, with further consideration of a 1.5-degree maximum,” said Christiana Figueres, executive secretary of the UN Framework Convention on Climate Change, UNFCCC. “Now, more than ever, it is critical that all efforts are mobilized towards living up to this commitment,” she said Monday at the opening session of the Bonn meeting. Last week, the International Energy Agency estimated that 2010 emissions from global energy generation hit record highs, a sharp rebound from the effects of the financial crisis. In addition, the U.S. government’s atmospheric research facility, the Mauna Loa Observatory on Hawaii’s Big Island, reported last week that atmospheric concentrations of the greenhouse gas carbon dioxide peaked yet again in May. Negotiators at the Bonn meeting are working “to provide clarity on the architecture of the future international climate regime to reduce global emissions fast enough to avoid the worst climate change,” the UNFCCC said in a statement. They are working on the design of the finance, technology and adaptation institutions agreed in Cancun that will allow developing countries to build their own sustainable futures. The Cancun Agreements formalized governments’ climate change mitigation pledges and increased accountability for them, and took action to protect the world’s forests, which absorb carbon dioxide. 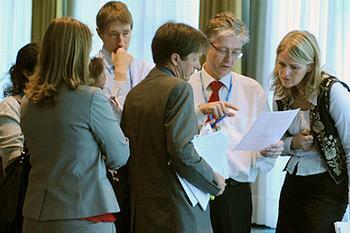 In Bonn, delegates are working on two tracks – Annex I Parties, the industrialized countries, who are legally bound to reduce emissions under the Kyoto Protocol – and other countries who form the Ad Hoc Working Group onLong-term Cooperative Action (AWG-LCA) under the Framework Convention on Climate Change. But on Monday, meetings were postponed again and again as, behind closed doors, negotiators tried to agree on agendas. Time is running out. The first commitment period of the Kyoto Protocol expires at the end of 2012 and no agreement is in place to take up where it leaves off. 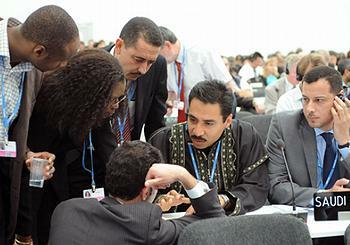 An important decision for climate negotiators this year is the fate of the Kyoto Protocol. Some signatories – Canada, Russia and Japan – have said they are dropping out. But the EU countries are supportive of the Protocol. The EU delegate at Bonn reiterated the bloc’s willingness to consider a second commitment period in line with its previously stated conditions, including an overall level of ambition sufficient to achieve the two degree Celsius target. The Kyoto Protocol is strongly supported by many developing countries who maintain that they did not create the climate change problem but are being forced to bear its consequences. They favor continuing legally binding emissions limits on the Annex I countries. Jorge Arguello, Ambassador to the UN, Argentina, and Chair of the G-77/China Group, told delegates in Bonn of the group’s concern with the slow progress towards a second commitment period, emphasizing the need to reduce the gap between pledges and what is required by science and historical responsibility. Egypt, speaking for the Arab Group, called the Protocol the most important legal instrument addressing climate change and called on Annex I countries to respect their legal commitment to a second commitment period. Bolivia, for the Boliverian Alliance for the Americas, called the Cancun Agreements a step backward and called for agreement on a second commitment period in Durban. Pablo Salon of Bolivia introduced a proposed agenda item on the rights of nature and the integrity of ecosystems. Mexico, speaking for the Environmental Integrity Group, expressed commitment to working towards early completion of the work of the Ad Hoc Working Group on the Kyoto Protocol to avoid a gap between commitment periods, while highlighting links between the two tracks. Making the Green Climate Fund, established at Cancun, fully operational is one of the most pressing issues for Parties to settle as soon as possible, said the world’s largest environmental advocacy group, the International Union for the Conservation of Nature. 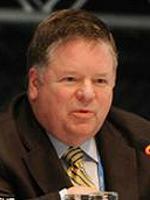 The pledges to reduce greenhouse gas emissions made so far are insufficient, the IUCN warned. 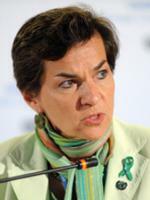 The first step towards the establishment of the Green Climate Fund was taken in 2009 at the UN climate summit in Copenhagen where the donors agreed in principle to support developing countries with fast start financing of US$30 billion for the period of 2010-2012 and committed to mobilize jointly US$100 billion a year by 2020 to address the needs of developing countries. The first meeting of the Transitional Committee for the design of the Green Climate Fund took place April 28-29 in Mexico City. Three ministers were chosen to co-chair the Transitional Committee: Mexican Finance Minister Ernesto Cordero Arroyo; South African Minister for Planning Trevor Manuel; and Norway’s State Secretary at the Ministry of Finance Kjetil Lund. Four work streams were identified for the Committee, to be led by eight work stream co-facilitators. The first work stream covers scope, guiding principles and cross-cutting issues. The second focuses on governance and institutional arrangements. The third work stream considers operational models and the fourth addresses monitoring and evaluation. IUCN and many other environmental groups believe that forests are central to efforts to deal with global climate change. They are promoting nature-based solutions to climate change, through REDD (Reducing Emissions from Deforestation and Forest Degradation) and through recognizing the role nature can play in increasing resilience and reducing vulnerability of people in the face of climate change.